Lucasfilm president Kathleen Kennedy is here to stay! The legendary movie producer, who took over from Star Wars creator George Lucas as head of Lucasfilm in 2012, signed a three year contract extension with the Walt Disney Company to remain in that role, Borys Kit from The Hollywood Reporter reports. The deal keeps Kennedy, who was recently honored with the Irving G. Thalberg Award by the Academy of Motion Picture Arts and Sciences, with Lucasfilm/Disney through 2021. 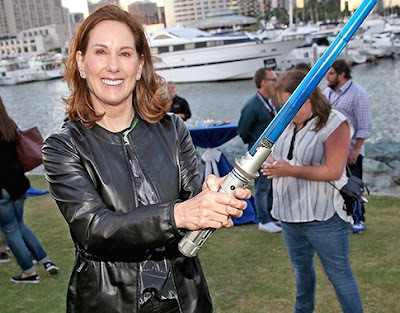 Since taking over Lucasfilm in 2012, Kennedy has overseen the release of four new Star Wars films which have collectively grossed over $4 Billion. She's also overseen the development of new Star Wars projects outside the cinematic realm, including the theme park expansion Galaxy's Edge coming to Disneyland and Disney World next year, and the creation of the ILMxLAB, a division of the legendary visual effects studio devoted to virtual and augmented reality storytelling, who will be launching Vader Immortal: A Star Wars VR Series in early 2019. Kennedy's tenure with Lucasfilm has not been without its bumps in the road. Two of the films released underwent massive reshoots, and there have been three incidents where directors have needed to be replaced at various points within development of the films (including during filming, as happened on Solo: A Star Wars Story). Not to mention the fact that the most recent film she oversaw, Solo, was viewed as a box office failure for only making $392 million worldwide (not enough to cover the marketing and inflated production budget due to the directors change). Despite these bumps in the road, Kennedy's time at Lucasfilm has been viewed as a success by most. She succeeded in bringing the Star Wars franchise back to mainstream prominence, despite a ten year gap between live action films. In addition to the four billion dollars at the box office, billions more have been brought in through merchandising and other projects under her watch. Kit describes the deal in the THR story as "a vote of confidence" in Kennedy's leadership of Lucasfilm and her stewardship of the Star Wars brand, despite Solo's lackluster performance. As for what comes next for Kennedy and Lucasfilm, she is currently overseeing the production of Star Wars Episode IX which director JJ Abrams is currently shooting for a December 2019 release. On the cinematic side, Lucasfilm is moving ahead with new film trilogies from Game Of Thrones showrunners David Benioff and D.B. Weiss, and The Last Jedi writer/director Rian Johnson (Benioff and Weiss' films seem to be coming first, as Johnson is currently working on an original project between his Star Wars films). Kit also reports that television is where most of the immediate plans for Star Wars lie, with Star Wars Resistance debuting on the Disney Channel next month, and both a live action series from Jon Favreau and the relaunch of Star Wars: The Clone Wars slated to premiere next year on the upcoming Disney streaming service. This announcement is great news for Star Wars fans. For the past six years, Lucasfilm has been under the stewardship of one of the most prominent, successful, and well respected producers in the film industry. She has proved her merit time and time again, delivering four critically successful films, three of which grossed over $1 billion dollars with two of them being in the top ten highest grossing films of all time. With at least three more years under her guidance, it will great fun for fans to see what other wonders Lucasfilm can achieve.